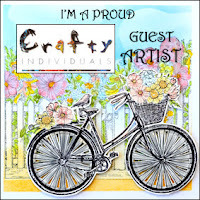 Just a simple tag today, which I have made for my little December Daily Album.I left a white Snowy space at the bottom of the tag to add a date stamp on the day we select and bring our tree home.I used Watercolours to create the background and also to colour the Clarity Stamp car. I watered down some white acrylic paint for my snow. 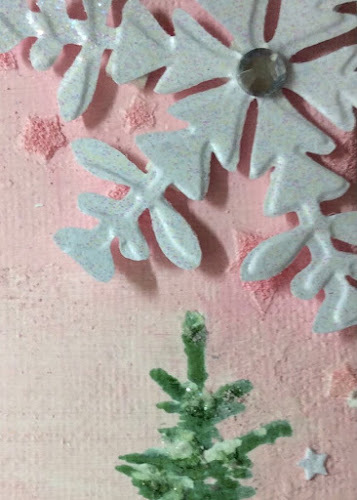 I painted them and then added a coat of crackle.Sitting happily inside this one you can find a snowman or snowlady, a snowflake, both painted and decorated. Some dried elements, flowers pine cone etc, and some sumptuous pink berries. I also used mini polystyrene balls, and oh my goodness they went absolutely everywhere! I think I will still be finding them at Easter! Hello , I am in full Christmas making mode! I decided to make keepsake plaques for my family this year, and this one is for my sister.She takes several holidays in the Lake District each year.When I saw this charming Hobby Art stamp at the Alexandra Palace in September I thought it would make a perfect Christmas card for her. I watercoloured the image and flicked my brush with white paint to create the snow.I love to use elements from nature so I chose a gorgeous piece of birch bark to mount it on and then added a pine cone, curly moss and a gorgeous pink berry. 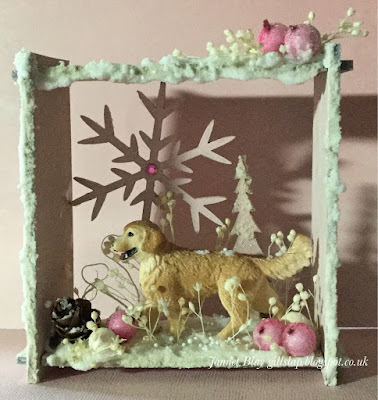 How are your Christmas /Winter crafts going? I would like to enter A Winters Meadow into the following challenges. I have a rather large pile of boxes because they maybe useful one day! 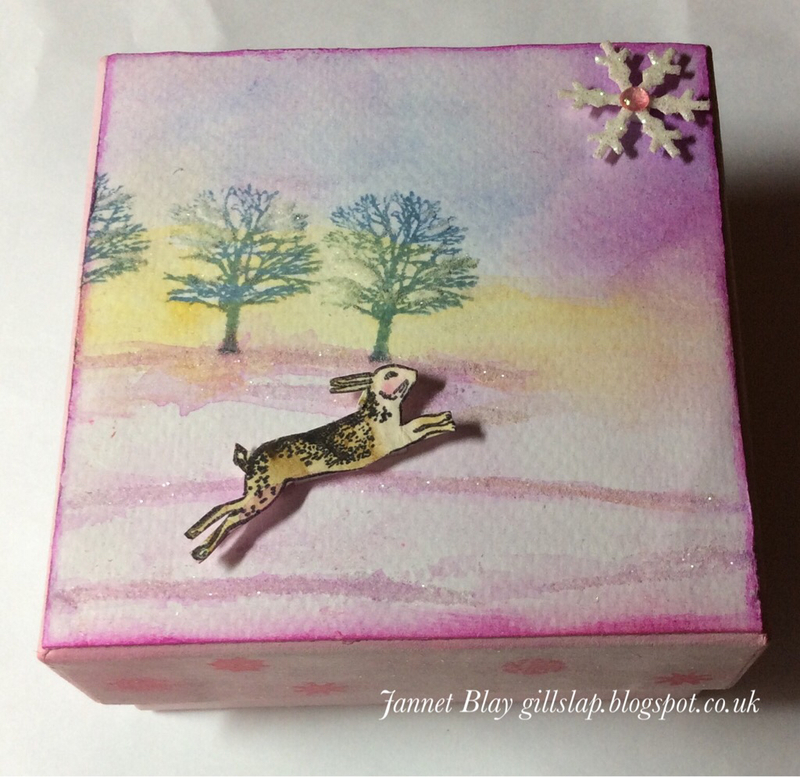 I have actually used one of those boxes to make a little 3 inch square gift box. 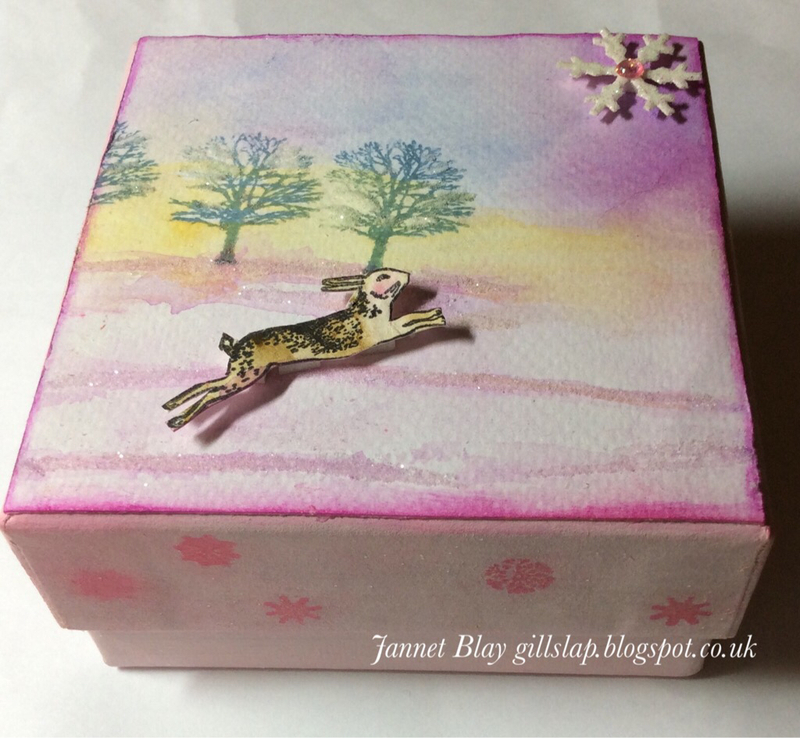 I painted the box pink, and stamped tiny snowflakes on the sides of the lid. 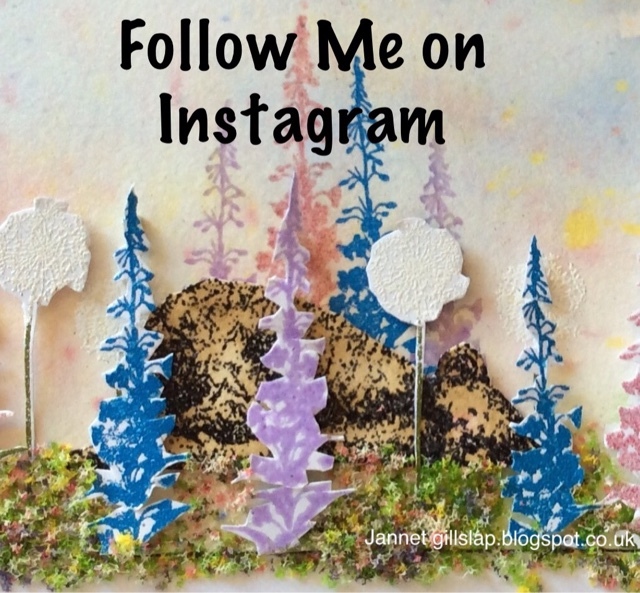 The scene on the top was created with watercolours and glitter, and a lovely set of Forest Magic Stamps. Thank you so much for visiting, I hope to see you again soon! 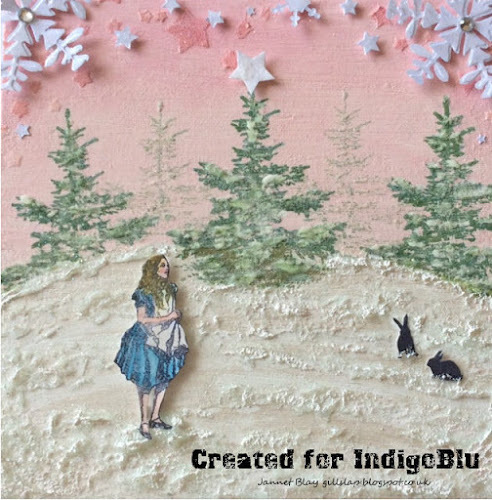 In the winter, Wonderland becomes Winterland, and Alice loves to walk in the snowy forest. I painted the top of my 20cm (8inch) canvas with Iced Gem paint, and randomly painted on Snow White metallic paint on the bottom. I used the star stencil and Slap it On to add some raised stars to the top of the canvas and also painted those pink. I used Archival Olive Ink pad to stamp the trees from the Winterland wood stamp set. I stamped the two distance trees without reinking the stamp, so it gave a more faded and distant look. 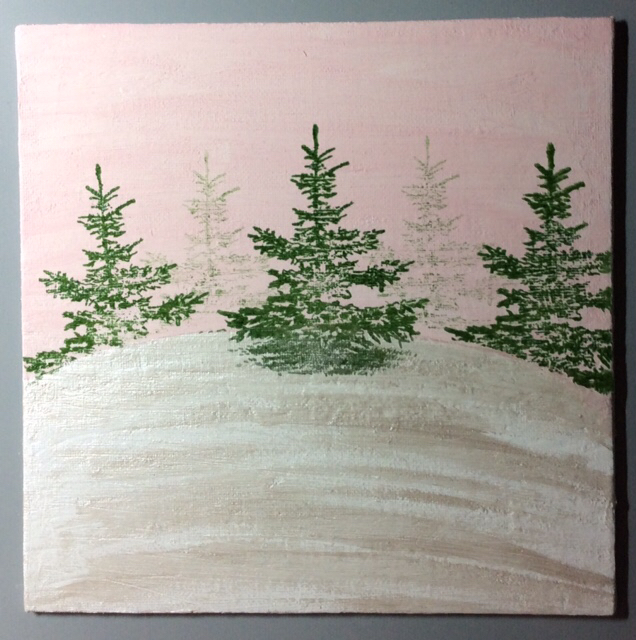 I used white paint to add snow to the trees which was followed by flitterglu and white glitter. 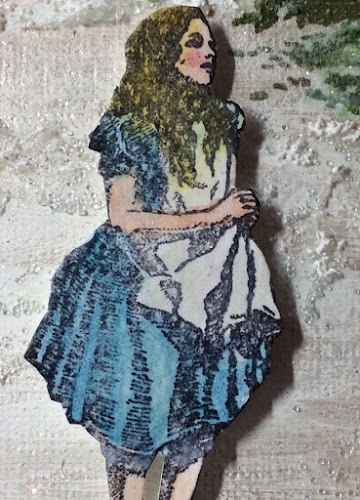 I stamped and coloured Alice from the Indigoblu Alice stamp set, and stamped the bunnies in black Archival from the Winterland set. I fussy cut them all out and adhered them to the canvas. 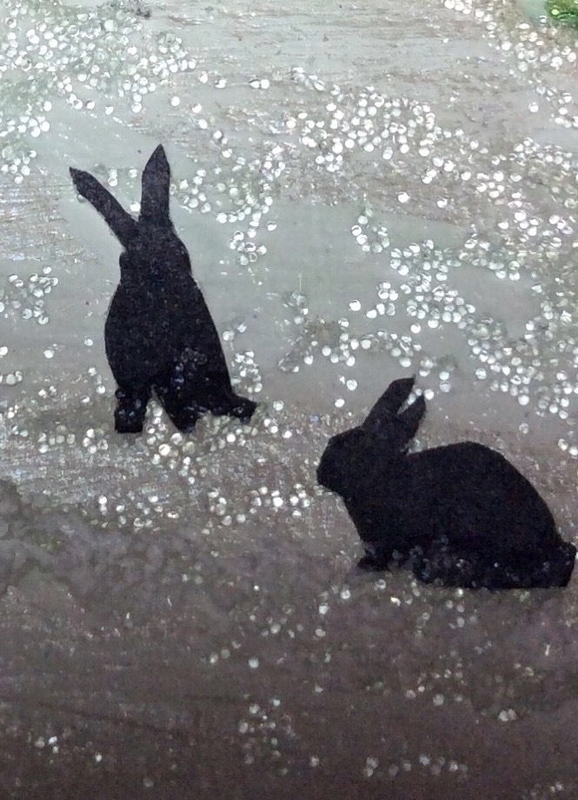 I spread glass bead gel medium to the bottom of the canvas to give some glistening texture to the snow. When it was dry, I lightly added white paint to some areas. I Die cut some snowflakes and stars in various sizes and covered them in Flitterglu and white glitter. I adhered them to the top of the canvas using sticky foam pads. Thank you so much for visiting, I hope to see you again soon. I would like to enter Alice in Winterland into the following challenges.